CMM arms (also called articulated arm scanners) are a portable & convenient way to do 3D scans and allows you measure on the machine or shop floor. While they do require training, once mastered they are very versatile, yielding accurate and reliable 3D measurements. Articulated arms can be equipped with different length probes and scan heads, making them capable of meeting a wide range of scanning needs. Structured light scanners are known for their very high accuracy. They are often able to be used with a turntable which makes scanning certain types of parts quicker. With structured light scanning, a pattern of light is projected onto the part, and two cameras capture the way the pattern is affected by the geometry of the part. Photogrammetry is used to analyze the camera images and create the 3D point clouds. Structured light scanners are an invaluable tool for scanning certain types of parts. Portable handheld scanning is very useful for scanning on-site or in tight spots such as parts that are affixed to an aircraft or large machine. 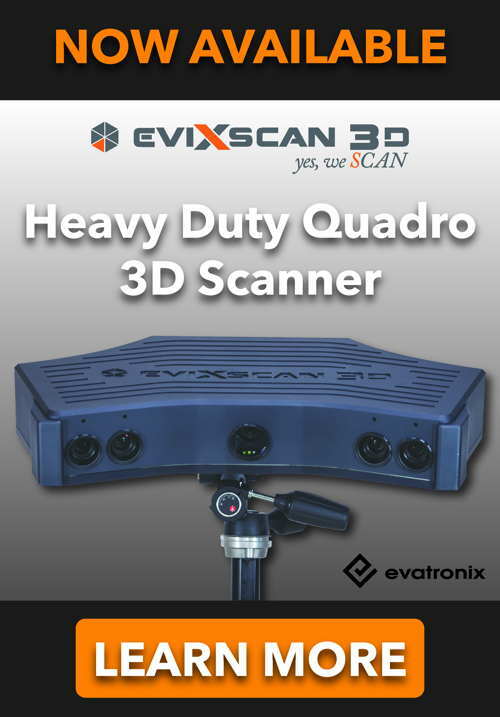 When used in conjunction with photogrammetry, they can scan large areas with high accuracy. When used as a standalone scanner, the accuracy is limited based on the size of the part. Industrial CT Scanners have the capability to capture the interior geometry of a part without any harm coming to the part itself. CT scanners use an x-ray to detect slices of the part which are then combined to create a 3D point cloud. CT scanning is frequently used to obtain extremely accurate high-resolution scans of small parts. Laser scanners are widely used to scan parts (see Long Range Scanners below for another kind of laser scanner). Laser scanners work by emitting a laser line which is monitored by a camera to see how the line’s shape changes when passed over the part geometry. Laser scanners can be affixed to a CMM arm to track position, or work in conjunction with cameras and targets for positioning. Long range scanners and allow for measurements of large objects and areas such as plants and factories. They are tripod-mounted and utilize a spinning mirror that reflects a laser beam off of all objects in its vicinity to capture a 360-degree panoramic scan. Multiple scans are taken from different vantage points for coverage. The scans are then combined to create an accurate point cloud that can be used for a variety of purposes. Arrival 3D employs many of these technologies as well as structured light and drone scanning. This allows us to capture objects and areas ranging from 1″ and less to 100’s of feet in size. We can mount long range scanners on a car for convenient on-site outdoor scanning. Our UAV (drone) scanner can capture 3D geometry of wide areas very quickly.